The National Institute of Child Health and Human Development (NICHD) also use this definition. 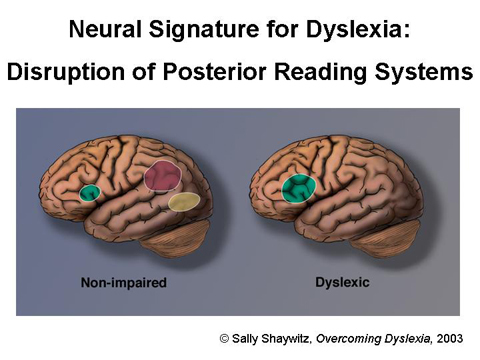 Dyslexia is a type of specific learning disability that causes difficulty mainly with reading, but also with writing, spelling and word pronunciation. Other difficulties may include problems with the memory and processing information. This means they may have problems remembering and blending sounds when reading, recalling information and familiar words and following multiple instructions. Things may not be automatic for them and they have to concentrate on the task at hand. Dyslexia is a life-long condition and affects 3-10% of people. There is also a genetic link to dyslexia, therefore it can be inherited. People with dyslexia have been shown in studies to use a different part of their brain in the process of information. Many people are also shown to have intelligence which is average to above average. Brain scans revealed under activity in centres towards the rear of a dyslexic’s brain when they were challenged in a reading test. A region toward the front of the brain was overactive but didn’t perform well. The findings provide dramatic evidence that people with dyslexia are not poorly taught, lazy, or stupid, but have an inborn brain abnormality that has nothing to do with intelligence, say the scientists from Yale School of Medicine.